As you may know, moisture is as important for your eyes as it is for your skin. According to the American Optometric Association, more than 30 million Americans wear contact lenses, and many of them suffer from dry eyes. 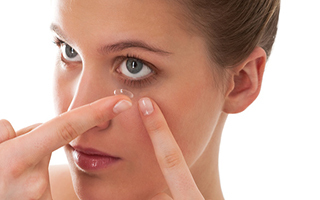 Wearing contacts can increase your risk of experiencing dry-eye symptoms. Fortunately, if you hate the symptoms, but love your contacts, a new study has identified a way to get relief. This six-month-long study involved 496 contact lens wearers, who were randomly split into two groups. One group received a daily placebo of corn oil. The other group received omega-3 fatty acids. At the beginning of the study, after three months, and after six months, the researchers measured tear film break-up time, tear production, and conjunctival impression cytology, which helps identify eye disease. The participants also filled out questionnaires asking about their dry-eye symptoms and how comfortable their contacts were. By the end of the study, the group receiving omega-3 fatty acids reported that their comfort levels while wearing their contacts had improved significantly. Their tear film break-up time and conjunctival impression cytology also showed significant improvements. Tear production improved slightly as well. The researchers noted, "The results of this study point toward benefits of orally administered omega-3 fatty acids in alleviating dry eye symptoms, improving lens wear comfort, and cytological changes in contact lens wearers." If you wear contacts and have been bothered by dry eye symptoms, try an omega-3 supplement and/or make sure you eat foods containing these beneficial fatty acids, such as salmon, chia seeds, and walnuts. You may be able to continue to enjoy the convenience of your contacts without the irritating dryness.